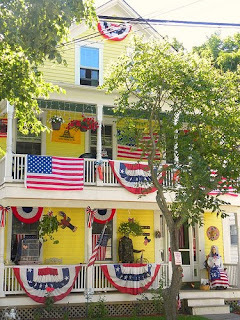 Bristol, Rhode island has one of the biggest and most famous 4th of July parades in the nation. It is always featured on news across the country as well as CNN and FOX. 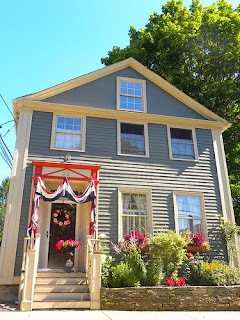 Yesterday my friend and I caught a glimpse of just a few houses that were dressed up along the parade route. I love the one with "Betsy Ross" and camouflage guy on the porch!! The top photo is an example of understated, yet lovely touches. 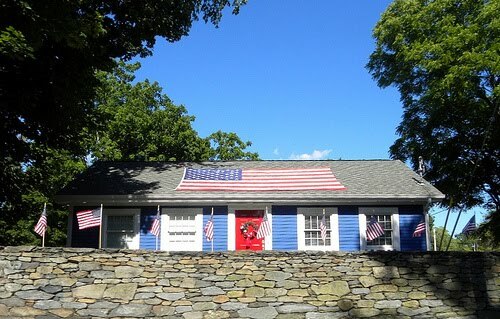 The little blue house has flags all along the wonderful stone wall, a typical New England sighting . There's an art to those walls. Have a safe and happy 4th of July my friends! For more Six Words, click here! Our parade for Canada Day was on July 1st. And now it is Stampede weekend, with another parade today! The Williams Lake Stampede is famous all over the world as well. Similar to the Calgary stampede, only smaller, it has numerous events, entertainment and enough excitement to last till next year! It is a huge rodeo, in case it is not as famous as I thought, haha!! 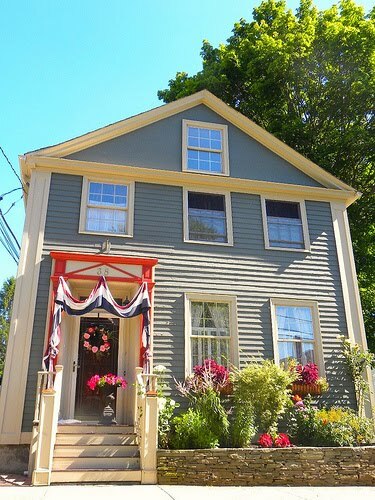 I love the way Americans decorate their homes for July 4th. My favourite is the first one...very understated, although the second one I'm more likely to have seen on tv. Have a very happy 4th of July!!! I think I am with you as far as the viewing goes. Happy 4th. Love the views. So patriotic! Good idea not to attend! I never want to fight big crowds! Hey, I will look for it on FOX or CNN though...that will be fun! P.S. Love these houses all decked out, BTW! Especially the yellow one, as my house is yellow, but not quite that bright (although I like it bright, and toned down with the trim color)! You are wise to stay home, curl up with Brian and the Furry Ones, have a glass of wine and watch it on tv! Happy 4th to you too. I have to tell ya, I am not a big fan, the fireworks scare my animal boys and my neighbors will be firing them off for at least two weeks. Everything is all about the happiness of my boys :-). These places look great. Everyone is certainly in 4th of July mode. I hope you have a great one. you've just nudged me into the spirit of the holiday. here's to freedom, my beloved p.p. friend. Love those! We should decorate more for the fourth! How wonderful to celebrate freedom! Lovely 6 words this is! I hope you are having a wonderful relaxing weekend Lolo, thank you for sharing the photos, it's beautiful where you live! anne, i have to tell you that i have heard the boston symphony on july 4th on the banks of the charles river many times. the entire experience was always close to mystical. i didn't know it would not be broadcast. BOOHOO! I love these too, LOLO! Thanks for sharing, and you have a great 4th as well. I can't imagine having to claim a parade spot by 4 am! Wow...Thanks for sharing the pictures of the decorations, they are great!